There are several critical deployment stages that support a successful implementation. Understanding the importance of each stage and the key objectives for success leads to more effective enterprise implementations. 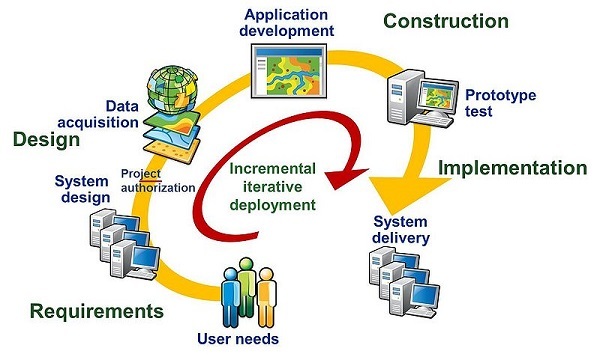 The figure below shows a series of typical system deployment stages for building and maintaining successful enterprise GIS operations. System design implementation strategy moves through several steps that require planning and implementation management. User needs establish a foundation for completing the design. User location and peak business loads establish a foundation for system architecture design. Infrastructure upgrade requirements must be identified to determine deployment costs. Network communication capacity is an important consideration for GIS deployments. Hardware and software procurement requirements must be identified. Software development requirements and data acquisition needs must be identified. Best Practice: Business decisions for project funding and procurement authorization are often required for project effort to proceed beyond this phase. System procurement authorization, based on the design budget and deployment timeline. Data acquisition and database design efforts begin. Procurement authorization for application design and development. Prototype testing plans completed and scheduled to validate product delivery within design performance targets. Initial deployment and operational testing. Final system delivery, user training, and workflow migration complete. Best Practice: Deployment process is repeated incrementally on a periodic schedule to leverage technology change. Capacity Planning Tools (CPT) have been developed as a framework to promote successful GIS system design and implementation. CPT functions contribute throughout the implementation cycle. The CPT tasks include reviewing business needs, establishing performance targets, identifying user locations, reviewing network suitability, selecting product architecture, and completing the system architecture design analysis. Additional tools are provided to validate system performance during the design, construction, and implementation phases. CPT models can be easily updated to reflect changes in business requirements and review alternative system deployment strategies, providing an adaptive model for addressing a variety of incremental planning activities. Best Practice: Build and maintain a simple system performance model that links user requirements with system design. Proper GIS planning is the most important investment any organization can make in building a GIS. Understanding your GIS needs, selecting the right technology at the right time, and establishing documented implementation milestones to measure your progress can ensure your success. This document is focused on sharing how to build and maintain successful GIS operations. The Capacity Planning Tools provide a framework for collecting what you know about your business needs and your system environment. The Capacity Planning Tool models connect what you understand about GIS user requirements with the network and platform loads your IT support teams can measure in the data center.